A bloodied and tired ronin is lying hidden amongst the long stalks of grass when a not so unattractive woman stumbles upon him and proceeds to slink out of her kimono, trying to seduce him. Ah... fortunes are looking up for the weary Gennosuke! Who, like any red-blooded man on the lam from a group of murder-minded swordsmen from his former clan, would naturally jump her bones... But not so fast! We're less than 5 minutes into Hideo Gosha's Sword of the Beast, so we know something is up. Yep, it's a trap. And Gennosuke just barely manages to get away from his pursuers in time, stealing a horse to make his exit, to the cries of "Have you no pride?" Gennosuke responds: "To hell with name and pride! I'll run and never stop!" We freeze-frame and the narrator tells us that the samurai Gennosuke killed his Enshu clan's counselor and has run off to his home prefecture to hide. Clearly this isn't going to be a film about honor, right? Wrong. This film has everything to do with honor. Admiral Perry has come to Japan and samurai Gennosuke has seen the writing on the wall: evolve or perish. So the samurai Gennosuke tries to foster a revolution in his clan - but he has been played by his more power-minded and strategic higher-ups who are willing to sacrifice him as collateral in a chess match for power. But what they fail to see, because they are so entrenched in the minutia of old feudal system, is that 'honor' as they define and follow it no longer matters in a world where western ideals will render it anachronistic and quaint. The samurai Gennosuke, then, becomes the ronin Gennosuke and chooses to be a beast if that means being opposed to the hypocrisy and corruption of the old order. What then becomes interesting is how this 'beast ronin' actually embodies more of the bushido philosophy and moral fortitude than the system that professes to administer and protect it. Sword of the Beast, we can say, is about a man who has no class and morality, who fights immorality and protects the last vestiges of honor in a land that is quickly falling apart. 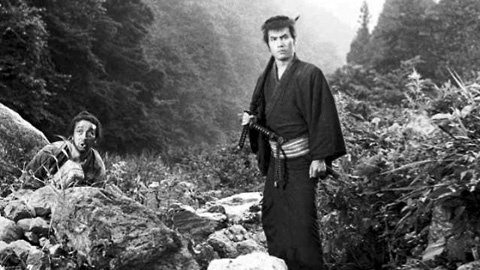 Coming from a television background, Hideo Gosha is famous for his rough and tumble brand of samurai films. 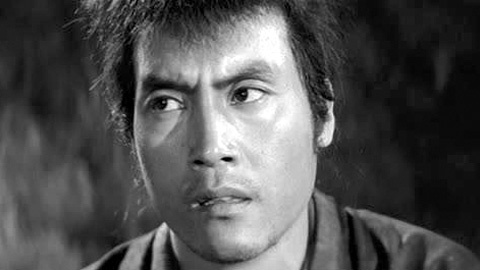 To be blunt, his movies just feel different than the others that populate the jidai-geki/chanbara schools. Part of this arises out of the angularity of their production. 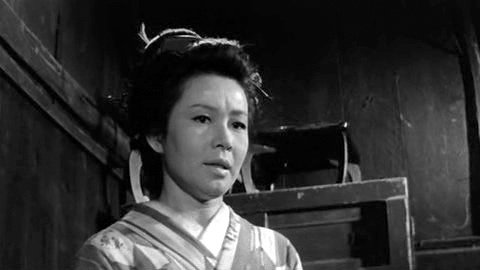 While perhaps too obtuse of a description of his filmmaking style, as a way of explanation we find that Hideo Gosha's films, when compared to Masaki Kobayashi's formalized geometric constructions and pre-Red Beard Akira Kurosawa's long-lensed action, feel looser in direction and rougher around the edges - and consistently defy the tradition of proscenium staged mise-en-scene seen in the period drama. Technically, Gosha's films also feel different because of their unique style of high-contrast black and white photography that is combined with a varied and random usage of long and short prime lenses and zooms. And while there is a predominance of close-ups as well as shots with very deep staging and blocking, Gosha will freely twist, turn, zoom, and freeze his shots in order to propel or pause his action as needed. In so far as Sword of the Beast is concerned, Gosha seems to be less inclined to stay committed to a specific aesthetic approach and as a result this movie has a more dynamic and shot-from-the-hip quality about it. In short, this film feels feral. Perhaps that is another reason why it's called Sword of the Beast?